Tags: 2020VQ, blind hiker, Randy. 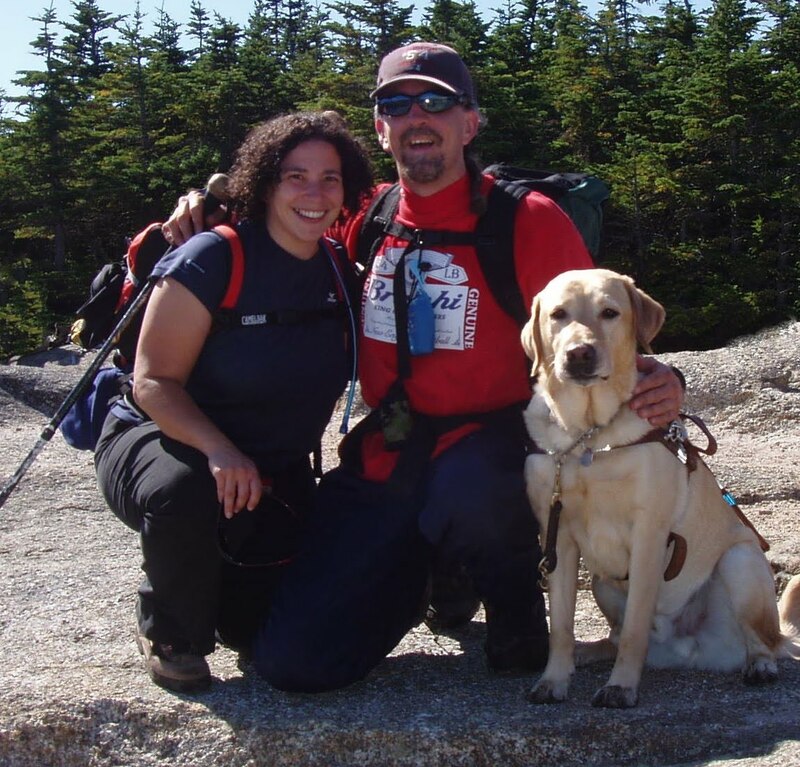 In 2009, while hiking some simple woods with the Mighty Quinn, Guide Dog Extraordinaire, I reflected upon how fortunate I have been with the manner in which I am able to meet challenges. I by no means hold the monopoly on challenges. But like everyone, I have had my share and the opportunities that arise from them. Just three years ago I was confined to a wheelchair. Now, I not only walk, I hike. I run. I explore the expansive world around me with Quinn leading the way. I am so very appreciative. So when Quinn and I were invited to hike a local mountain with Tracy, we took her up on the invitation. On the hike, I was amazed at the attention, devotion and ability with which Quinn guided me up the challenging trail. Resting atop the summit of Pack-Monadnock, I reflected well upon how a series of small steps had led to this very gratifying accomplishment. Metaphorically I delight in reaching summits and in the notion of achieving a goal and attaining new heights and the whole process that goes with it. On that day, experiencing a world which had seemed out of my reach, my spirit was bolstered and I knew that it was time for more of this type of journey in my life. This is how the 2020 Vision Quest was born. While the 2020 Vision Quest has quickly evolved well beyond my initial thoughts (look I have a website! ), in its essence it epitomizes using small steps and community to accomplish a grander result. I do not consider the 48 peaks just a checklist to race through. For me there is an accomplishment to setting 48 as the first of many goals in my future and I intend to savor the entirety of the experience which leads me to and through all of the individual ascents. Along this journey I will savor and share these moments and, the trails willing, inspire and motivate others to create their own moments. Thanks for joining us.